Screening for breast cancer, using various imaging modalities, aims to achieve 100% sensitivity (percentage of true positives) while simultaneously yielding 100% specificity (percentage of true negatives). When the result of a screening examination is false positive, the woman has to endure the uncertainty of recall for a follow-up study and, very often, the discomfort and pain of a biopsy. When the result is false negative, she is sent home under the mistaken impression that her breasts are cancer-free and, perhaps, with unfortunate sequelae. It is not surprising that there is currently no single imaging system available that can meet the dual targets of 100% sensitivity and 100% specificity. Mammography has been the gold standard for breast screening for the past fifty years. Although digital X-rays, introduced in the past decade, have improved the sensitivity over traditional screen-film mammography, the modality performs poorly when the woman has dense breasts (sensitivity < 70%). Ultrasound has also been used for almost fifty years but it has not, until recently, been used in a screening environment. What then has changed and is it possible that ultrasound might replace mammography in the future? Ultrasound has the distinct advantage that it can detect lesions in dense breast tissue when these same lesions are mammographically occult. Furthermore, ultrasound can distinguish between a fluid-filled cyst, which is benign, and a solid mass, which can often turn out to be malignant. 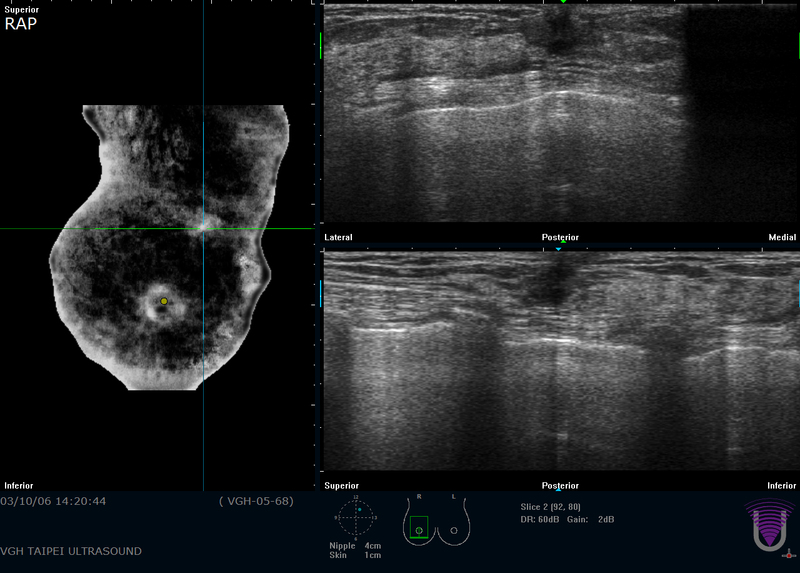 With hand-held ultrasound, however, the quality of the images is highly dependent on the skill of the operator while the procedure itself can take up to 45 minutes to perform. These limitations have led to the development of Automated Breast Ultrasound, or ABUS, with commercial systems recently introduced by SonoCiné, U-Systems and Siemens. These ABUS systems work by moving the transducer across the breast under automated control so that multiple 2D ultrasound slices can be combined to yield a 3D volumetric representation of the breast. In a screening environment, the time to acquire images of a patient is now just 15 minutes. Dr Jinnah Phillips, a radiologist in the state of Connecticut which has mandated screening ultrasound for women with dense breasts, says “Being able to offer ABUS for use in combination with mammography has been a worthwhile addition to [our] practice”. The operative words here are “in combination with” and so, for the foreseeable future, digital mammography will have a critical role to play. ABUS technology from U-Systems provides 3D images of the breast.